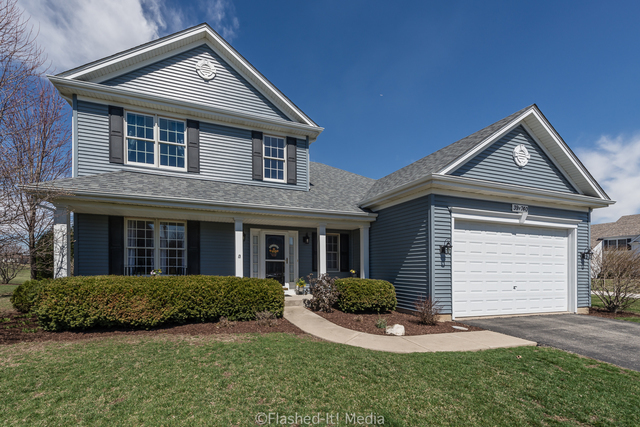 Impeccable like new home located in Mill Creek of Geneva offering Golf Course views! Custom Built by original owner! full front porch elevation~Almost 3500 SF of lovely living space~Hardwood floor foyer entry~unique 10ft. ceilings on entire first floor~family room has custom limestone fireplace & niche~Awesome Kitchen boasts 42"white cabinetry/Quartz countertops/backsplash/breakfast bar/hardwood flooring~hard to find convenient 1st floor luxury master suite has soaker tub/dual basin/separate shower & walk in closet~2nd floor w/2 additional bedrooms & loft that could easily be converted to 4th bedroom~1st floor laundry~Huge finished basement w/recreation room/media area/workout room~extra tall garage door fits full size van & attic storage~patio~so much new...windows 2019~roof/siding/H2O heater/sump pump 2018~furnace 2017~Reverse osmosis~lawn sprinkler system~Mill creek features elementary school/2 golf courses/clubhouse/pool/walking trails~minutes to Metra for commuters!